"The Follower" and "The Bloody Souvenir" are my go-to read alouds for middle school students. They are funny, disgusting, and relatable. I once heard TCRWP Goddess Mary Ehrenwerth say that if kids weren't begging for more at the end of a read aloud, you picked the wrong text. That was never the case with those two short stories. Kids were dying for more misadventures with Jack and the Pagoda brothers. This book is the answer to that desire. 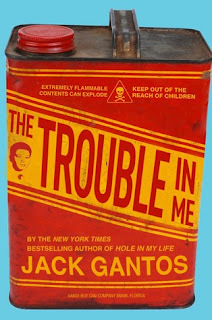 The Trouble In Me is a preface to Hole In My Life, a sneak peek at how Gantos got set on the path that led to imprisonment for drug smuggling. 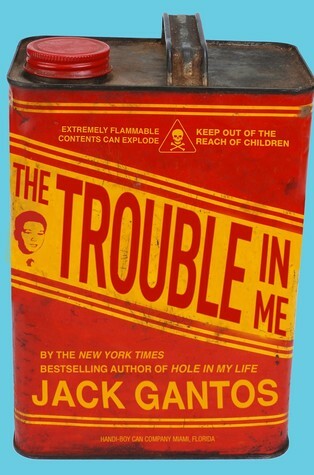 This would be an awesome pre-high school summer reading book, with Hole In My Life read and discussed in class. When does lighthearted mischief go too far? What are the possible consequences for being too much of a follower? There is so much to discuss. As for the casual fan of the Pagoda brother stories, they should stick to the shorter version. This memoir is written with the wisdom of adulthood; the short stories are in the moment, and therefore, more humorous. The longer version is colored by the fact that these events led Gantos to prison. The short stories could be any reader. It was interesting for me to read about the same events through a darker lens, but I will be keeping the short stories in my rotation, as opposed to the memoir.